Rights groups have called on Donald Trump to end his Asian journey with a strong statement against Duterte's drugs war, which has seen police and suspected vigilantes kill thousands of people. Manila: Donald Trump shook hands Monday with a smiling Philippine President Rodrigo Duterte, a man who boasts about personally killing people and who is waging a drug war that rights groups say involves mass murder. The US leader is in Manila with leaders of 18 other nations for two days of summits, the final leg of a headline-grabbing Asian tour dominated by the North Korean nuclear crisis. Allegations of Russian meddling in last year's US presidential elections have also hounded the second half of his 12-day trip, which took him from Japan to South Korea, China and Vietnam. Rights groups have called on Trump to end his Asian journey with a strong statement against Duterte's drugs war, which has seen police and suspected vigilantes kill thousands of people. 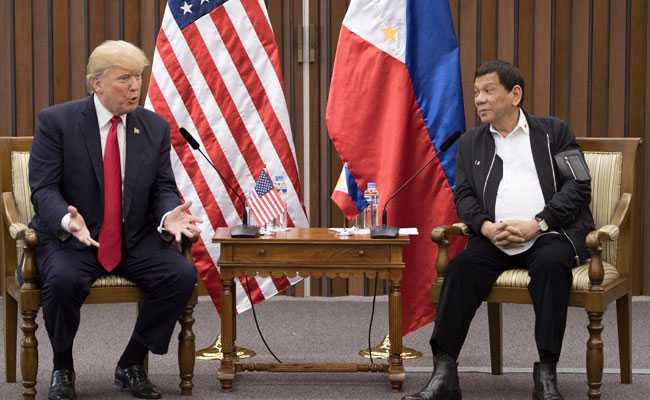 But brief encounters between them in the lead-up to official talks scheduled for late Monday morning appeared to support Duterte's confidence that Trump was not concerned with the killings. Trump shook hands with Duterte, then the pair chatted for about 30 seconds as the Philippine leader smiled broadly, before the opening ceremony for the first summit on Monday morning. Trump had his back to the cameras. The pair also sat next to each other at a pre-summit banquet on Sunday, during which they smiled, chatted and clinked champagne glasses. Duterte, 72, sang a Filipino love song in front of his audience at the banquet, saying in a light-hearted fashion that he did so on the orders of the US president. "I'm sure he will not take it up," Duterte said on Sunday when asked whether he expected Trump to raise the issue of alleged extra-judicial killings in the drugs war. He has also repeatedly boasted about killing people himself, most recently on Thursday while in Vietnam for the Asia-Pacific economic summit. Former US president Barack Obama was one of many prominent critics of Duterte's handling of the drugs war. The Philippine leader responded last year by calling Obama a "son of a whore". But Trump has appeared to be a fan of Duterte, telling him in a telephone call in April that he was doing a "great job". Duterte said on Sunday that Trump had offered him further "words of encouragement" during a brief chat in Vietnam the previous day on the sidelines of another regional summit.